India's Dipika Pallikal and Joshana Chinappa caused a big upset at the Commonwealth Games as they beat the mighty Malaysian pair of World No.1 Nicol David and Low Wee Wern in the women's doubles in Glasgow, on Wednesday. The fifth seeds from India brushed aside David and Wee Wern 11-8, 11-5 for their second win in as many matches in Pool D.
Pallikal and Chinappa face Megan Craig and Kylie Lindsay of New Zealand in their last league match later in the day. David is a legend of the game and on Monday retained her singles title at the Commonwealth Games. The surprising result also showed that the India duo's win over the formidable combine in a tri-nation tournament in Malaysia was no fluke. Pallikal and Saurav Ghosal are scheduled to play 12th seeds Samantha Cornett and Shawn Delierre from Canada in the mixed doubles. Pallikal had reached the singles quarter-finals and Ghosal became the first Indian to reach the semi-finals at the Commonwealth Games. 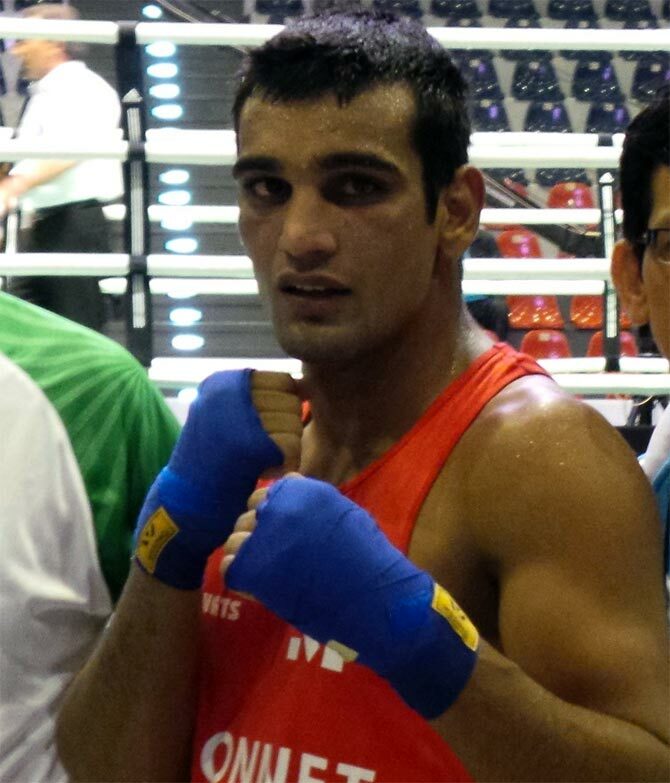 Young Indian boxer Mandeep Jangra assured himself of a medal in his debut Commonwealth Games by advancing to the semi-finals of the 69kg division after his opponent failed the medical test ahead of their bout. The Asian Championships silver-medallist, who has won two rounds so far in the event, will now be up against the winner of the clash between Canadian Custio Clayton and Northern Ireland's Steven Donnelly. The 21-year-old, a protege of former Commonwealth Games gold-medallist Akhil Kumar, was declared the winner after his rival, Daniel Lewis of Australia, failed to get the doctor's clearance to fight due to a cut above his eye sustained during the pre-quarterfinals. The Haryana-lad, whose affair with boxing started when he was all of eight, was expectedly ecstatic. "I never went in with any kind of targets as such. I just wanted to perform well. All these thoughts of medal and targets were set by Akhil bhaiyya. He had faith in me and I am glad that I repaid that faith. I am glad that I could do the country proud," Mandeep said. "It is the biggest moment of my career because my mentor, Akhil bhaiyya, left his training midway on hearing this news. I feel proud to have made him proud," added the boxer. Mandeep said he has it in him to finish on top of the podium. "I would now just watch the bout later in the evening and then make my strategies accordingly. I have trained very hard and I am feeling very good about my body right now. I hope I can go the distance," said the boxer. India's medal contenders, P V Sindhu and Parupalli Kashyap notched up easy victories in the women's and men's singles events respectively to storm into the Round of 16 of the badminton competition at the 20th Commonwealth Games. Indian shuttlers had a good day in office as P C Thulasi, RMV Gurusaidutt, Kidambi Srikanth and men's doubles pair of Pranaav Chopra and Akshay Dewalkar also advanted to the last 16 at the Emirates Arena. World No. 11 Sindhu had a walk in the park against South Africa's Sandra Le Grange whom she tamed 21-4, 21-6 in just 17 minutes, while Delhi Games bronze medallist, Kashyap streamrolled Dakeil Thorpe 21-9, 21-5 in a 19-minute men's singles match. World championship bronze medallist, Sindhu will next take on 17-year-old Thilini Hendahewa of Srilanka, while London Olympics quarter-finalist, Kashyap will face Australia's Jeff Tho. In another women's singles match, Thulasi made mince meat of Ireland's Sinead Chambers 21-10, 21-2 in 24 minutes, while Gurusaidutt brushed aside Edwin Ekiring of Uganda 21-13, 21-11. Srikanth also didn't break any sweat as he disposed off Daniel Font of Wales 21-8, 21-13. In the men's doubles, Pranaav and Akshay thrashed Sri Lankan pair of Sachin Dias and Buwaneka Dullewa 21-10 21-9 in 23 minutes.